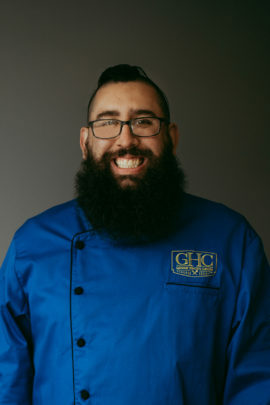 Meet Blue Coat Chef Ron. Ron is a valued member of the Blue Coat Army and a beloved member of his fraternity. His fraternity loves his homemade BBQ sauces, pickles and fermented food creations. Ron’s first job as a cook at a summer camp was what sparked his passion for cooking and he hasn’t looked back ever since. Ron’s favorite part about his job with Greek House Chefs is the genuine appreciation he receives from his fraternity after a meal. He (and his wife) also love the work-life balance that his job with Greek House Chefs allows them. One of his favorite memories with GHC was the Mother’s Day Brunch he was a part of with his Chapter. He remembers everyone showing up, laughing, enjoying food together and getting the chance to personally meet the mothers of the guys that he cooks for every day. He said that was a really special feeling to have all of the mothers come into the kitchen and say how relieved they were that he was making such great food for their sons.